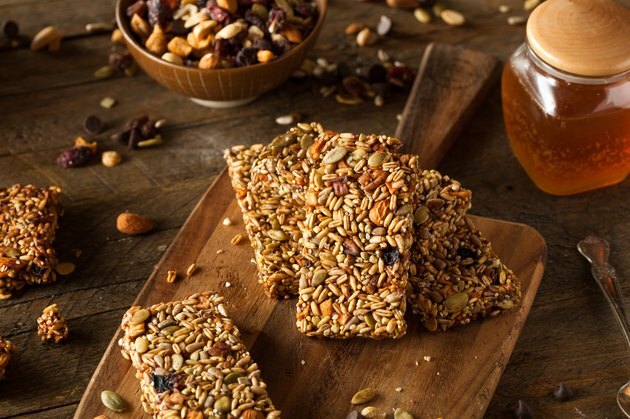 Health food bars are meant to supplement an otherwise healthy diet, whether it's as a snack, a meal replacement or to help you power through your workouts. Breakfast bars and cereal bars are commonly marketed as a fiber-rich snack. The problem is, not all fiber bars are created equal. Dietary fiber is found in foods like whole grains, beans, fruits and vegetables. It's beneficial for digestive health, and a high-fiber diet is linked to a lower risk of heart disease, according to the Harvard School of Public Health. Look for a balanced bar that's low in sugar and sodium. Some fiber bars contain supplemental forms of fiber such as psyllium. Choose a bar that contains a food source of fiber, recommends Consumer Reports. For example, bran is fiber-rich, and many high-fiber bars contain bran, according to an article in the July 2008 issue of Today's Dietitian. Consumer Reports tested and rated fiber bars based on nutrient profile and taste. Kellogg's Fiber Plus Antioxidants Chocolate Chip Bar made the top of the list. It contains 9 grams of fiber and only 120 calories. In addition, it's low in sugar at 7 grams, is low in sodium and contains 3 grams of fat. The primary fiber source for the bar is rolled oats. Bonus: it contains real cocoa and chocolate chips. Fiber One Chewy Bars Oats & Chocolate Bar is another bar that made Consumer Report's top-rated list. It's made from whole-grain oats and contains real semisweet chocolate chips. The sugar content is low at 10 grams, and it's also low in sodium. You won't drain the calorie bank since the total calories comes in at 140. In addition, the Fiber One Chewy Bars contain about 4 grams of fat. Bonus: it contains no artificial flavors. The Gnu Foods Flavor & Fiber Bars Cinnamon Raisin is another top-rated option, according to Consumer Reports. It contains 12 grams of fiber made from a blend of high-fiber whole grains consisting of wheat bran, organic whole wheat, whole rolled oats, millet and flax, among others. It contains 130 calories, along with 3 grams of fat. In addition, it's low in sugar and sodium. Bonus: it's 100 percent natural and kosher. Use the nutrition labels to find a bar that meets your needs. Various brands offer nutritious options -- the "best" bar is one with a well-rounded nutritional profile that you find delicious. Garden of Life has a range of organic, vegetarian bars made from whole foods and packed with fruits, vegetables, nuts and sprouts and containing up to 6 grams of fiber. Renew Life offers a range of organic, gluten-free bars packed with 14 grams of fiber. NuGo and Luna are other high-quality brands. Are Fiber One Bars Healthy?